This book covers the basics of private land mobile radio systems including traditional dispatch, analog trunked radio, logic trunked radio (LTR), and advanced digital land mobile radio systems. 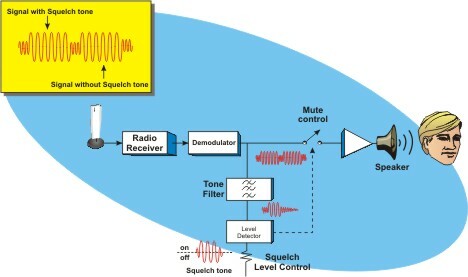 This figure shows a tone controlled squelch system. In this diagram, the radio receiver only un-mutes (connects) the audio signal when an incoming RF signal level contains a particular squelch tone. This permits to receiver to block out conversations from other nearby users that do not have the same squelch tone. The figure shows a typical integrated dispatch enhanced network (iDEN) system. 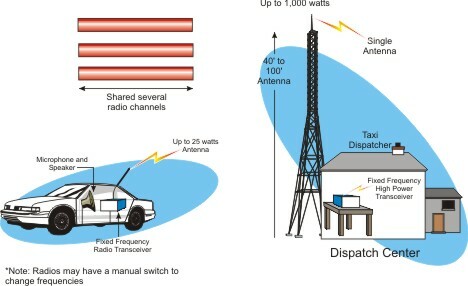 This diagram shows that the iDEN system communicates with mobile stations in two modes: dispatch and cellular-like. The repeater transmitters are called enhanced base transceiver system (EBTS). The EBTS contains the radio transceivers that link the radio channel to the network communication lines. The control of the EBTS is provided by base station controllers (BSCs). BSCs can control one or more EBTS units. 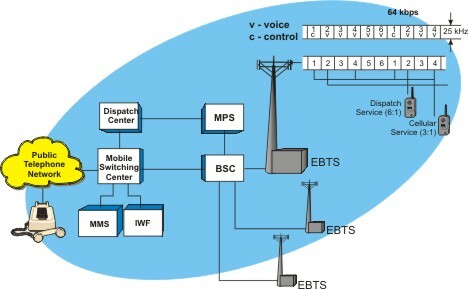 The BSC connects communication paths to either a mobile switching center (MSC) or to a metro packet switch (MPS). The MSC can connect (switch) voice calls to the public telephone network. The MPS routes dispatch calls (called direct connect) to a dispatch applications processor. Covered are the basics of LMR including simplex, half-duplex, and full duplex operation. The different types of squelch systems are covered including carrier controlled squelch, tone controlled squelch, and digital squelch. The basics of analog and digital trunked radio systems is provided along with how and why analog trunked radio systems are converting to digital trunked radio systems. The leading LMR industry standards including APCO, EDACS, MPT1327, iDEN, and Tetra are described along with simple diagrams to explain their operation. You will learn the key types of services that LMR systems can offer and the key applications that are driving the growth of the LMR industry. Included is a how LMR systems are still changing to offer new services.